All Ceramic Crowns go by a variety of brand names: Procera, Zirconia, Empress, Finess to name a few. Each uses a lightly different patented formula and handling techniques, but the bottom line is that they use do not use any metal. They are 100% ceramic. All Ceramic Crowns have been around for over a decade but the technology is reaching a point that All Ceramic is quickly becoming the product of choice for major restoration, especially when working in the cosmetic zone. One of the great assets of All Ceramic Crowns is their translucency. Unlike PFM’s the edge of each tooth is slightly translucent, allowing light to pass through the tooth like your natural teeth. Color is often layered on in multiple glazing, creating a slightly varied result. A good lab is essential for constructing this type of restoration. For the best results the dentist must maintain a close relationship with the lab through the entire process. 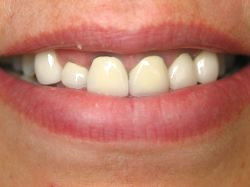 Compare the All Ceramic Crowns on the left with the PFM Crowns on the right.